Yeah, but: Pick a theme and stick with it. The Long Version: Swiss Army Knives are such paragons of multi-functional virtue that searching with Google for exact matches to "the swiss army knife of" produces over ten million results. Audio codecs, shovels, fighter jets, forensics, filmmaking, public health, portable grills, smartphones, snowmobiles, bank accounts, barn equipment, business agreements, workbenches, window treatments, tube amps, telecom equipment, essential oils, Linux, Listeria: if something has existed long enough for there to be a blog post about it, someone's called something The Swiss Army Knife Of it. 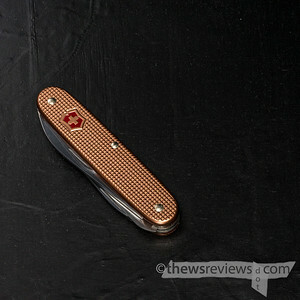 This makes June's SAK Of The Month, the Swiss Bianco special Victorinox Carver, especially perverse. Equipped with five tools in three layers, all it does is cut. The 93mm Carver is essentially an Alox Harvester that has had its cap lifter swapped out for a second large blade. That gives it two identical large blades, one pivoting from each end, and a hooked small pruning blade. The middle layer houses the exceptional Victorinox wood saw, and the fifth tool is the in-line awl. 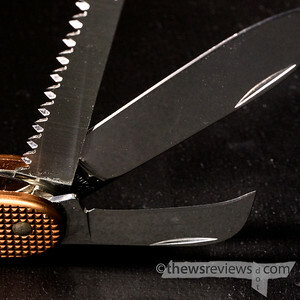 While that's technically more of a poking tool than a cutting one, it's an excellent rough-duty blade, and I wouldn't want to mess with one in a dark alley. The automatic question about the Carver is "why bother?" 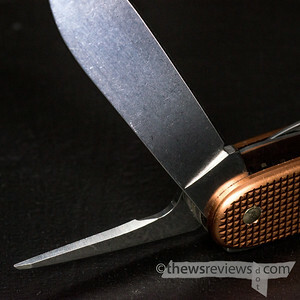 Why bother with a multi-tool that only does one thing, and why carry a knife the size of a three-layer 93mm Alox SAK when it has blades that open with nail-nicks and no pocket clip? Well, did I mention that it's a special with a limited (but unspecified) production run that was made with Copper-coloured Alox scales in addition to the unadorned-aluminum version? I have too much invested in Beanie Babies to keep track of Swiss Army Knife resale values, but I suppose novelty value must count for a lot. I'm an accumulator, not a collector, so even though I appreciate that it's an uncommon bit of cutlery my Carver is a working knife. The hooked pruning blade is excellent for breaking tape, although straight out of the box it verges on being too sharp and aggressive. Having a pair of large blades, while odd, does mean that the Carver can cover a lot of miles before needing to be resharpened. And the wood saw is simply unbeatable for any softer material its length can span. While I haven't used my Carver for this task yet, the SAK saw is my tool of choice for rough-cutting PVC or ABS plastic pipe as well as wood. While the all-blades all-the-time approach of the Carver is amusing and thematically appropriate, it would have been nice to see a metal saw in place of the second main blade. That would be a first for this size, as far as I can tell, which makes this dream configuration highly improbable – but by extension, accomplishing this remarkable feat would create a very desirable knife if Swiss Bianco could pull it off. I know I'd buy one, for whatever that's worth. About the only odd quirk of the Carver, aside from its existence, is that the second large blade sits higher in the handle when it's closed. This means it's an easier blade to open, and a more comfortable knife to hold when it's in use, so it's the one that I use for most tasks. I consider this a feature rather than a bug, since I always prefer to use one blade for the majority of the work, leaving the other freshly sharpened for critical tasks. The Carver is an easy knife to carry. Its weight rides securely in a jeans' watch pocket, the smooth tool-free back makes it easy to draw, and the thickness of its third layer gives it a square profile that's comfortable to use. While the Carver is thinner than the Mechanic, and so falls within my range for pocket carry, it wouldn't look foolish in a belt pouch, either. 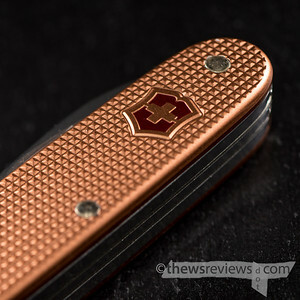 As a Swiss Bianco special, the Victorinox Carver is only available directly through the regional Swiss Bianco distributors, and not through Victorinox or other third-party retailers. I'm pleased to say that the Canadian dealer that I purchased from was helpful and easy to deal with, despite the lack of a traditional e-commerce website, and my Carver arrived promptly with reasonable shipping costs. I have no doubt that I'll be ordering from them again.